Handwriting that shows a vertical extension equal to or greater than 5 mm in the average letter body enters into this definition. This extension corresponds to the self's need to expand without considering the objective limits existing in reality. This not seeing is a form of cancellation, of psychological blindness that does not permit substantial action, but is based on sentiment's need to expand, which then expands into the dimensions in which this can occur without fear of being contradicted: it is the world of words, of descriptions, of the imaginative life invented theoretically and made heroic, but which resists the collision with the real world with difficulty. In this sense the personality loves everything that allows it to avoid tests and possible refutations, which it keeps strictly clear from. The optimism of the large size depends on this conviction, that it is possible to put everything in order with pretty speeches; then if this is not true, it is certainly not the duty of the large size to verify it, because due to its very nature it shrinks from any kind of test carried out through the precise corroboration of facts, causes and consequences. For this reason it does not have any disposition to science. tendency to exaggerate about both the intellectual qualities and the emotional-active dispositions; it is an indicator of the megalomania tendency" (Moretti, 1962, p. 76), since sentiment does not like to measure itself with the restricted boundaries of reality and makes the personality "enter into the field of exaggeration of the conclusive facility" (Moretti, 1962, p. 138). Everything is easy, everything is achievable when it tends "not to adopt measures in order to have the freedom to exaggerate" (ib.). It is a sign of imagination, fantasy, exaggeration, self-celebration, and consequently also of the tendency to lie, not due to deliberate deception, but as an indirect consequence of giving many versions of a fact, according to the mood of the moment, and then of not remembering what actually happened very well. Even the sensorial function, the simple focusing on particulars, is imprecise and therefore its mark in the memory is more weak. judgemental assertions and negations" (Moretti, 1962, p. 157), to "dramatic or tragic poetry" (Moretti, 1968, p. 156), to dramatic acting since it loves to show itself off, but also the visual arts based on perspective, such as architecture. Greater handwriting accentuation also comes out of art, as excessive expansion brings intelligence to forms of superficiality, exultation, but with a progressive decrease in the power of impact on the real world. 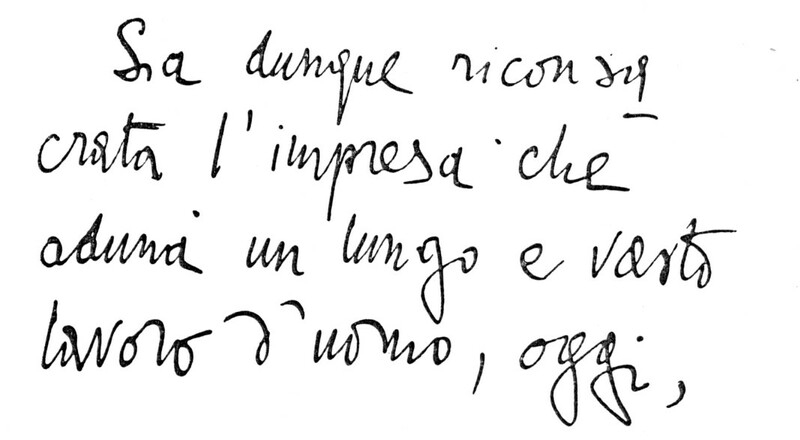 In this perspective it is easy to understand why in Moretti's book dedicated to the graphological analysis of famous historical figures, The Great and their handwriting, many small sized handwritings appear in the scientific, philosophical, political and even artistic field, but no handwritings larger than 5 mm appear, with the sole exception of cardinal Richelieu, with the obvious implications of lack of consistency in the personality ("For him everything is alright if he manages to make himself respected and make a fine show of himself. 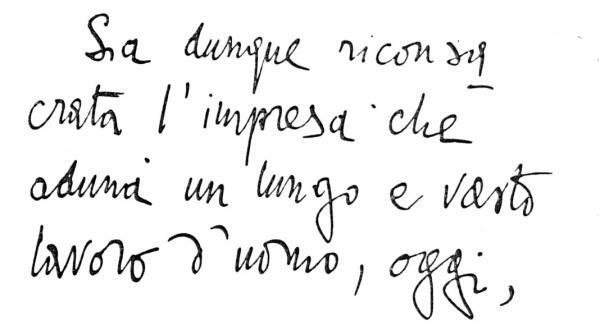 ", Moretti, 1966, p. 211). The large size always enters in the imponderableness of those who have not focused distinctly on the boundaries between themselves and the rest of the world, in the recklessness of fantasy that "flies, flies on many wings that many times melt like the wings of Icarus" (Moretti, 1972, p. 226). However, to enter into pompous and irritating megalomania, the sign must be accompanied by forms of studied solemnity and accuracy. If, instead, the large size appears in fluid and spontaneous contexts, the sign indicates simply the "tendency to excessiveness of concept and language" (Moretti, 1971, p. 79), disposition to optimism due to superficiality in the examination of reality, disposition to pleasure of the exterior appearance due to a sentiment that prefers the outlines at the expense of the substance.